I recently completed my PhD at Curtin University examining the physiology and behaviour of short-beaked echidnas (Tachyglossus aculeatus). One of the most interesting findings from my research was that echidnas are not as primitive in their physiology as once thought to be; in fact they are very well adapted. The primitive phylogenetic position of the short-beaked echidna has resulted in much debate about their physiology, but body temperature in particular. It is widely known that echidnas have a low basal body temperature, which is attributed to their phylogeny, low basal metabolic rate (BMR), and low energy lifestyle. Their variable body temperature has been central to many debates over the years, as early studies concluded that short-beaked echidnas were unable to regulate their body temperature, however, through laboratory and field experiments, I concluded that this is not the case, and they are in fact effective thermoregulators that utilise torpor to conserve energy. Short-beaked echidnas living in the eastern states of Australia utilise torpor and hibernation over the colder months to escape unfavourable conditions. These echidnas reduce their body temperature to <10°C for several months at a time, and display the ‘typical mammalian’ pattern of hibernation, where the long hibernation season is interrupted by periodic arousals. However, hibernation had not been documented for Western Australian short-beaked echidnas. I studied free-ranging echidnas over the course of one year, continuously recording body temperature, environmental temperature and location. There was no evidence of true hibernation, however, torpor (i.e. mini periods of ‘hibernation’) were common. Torpor slows the metabolic rate, which means that an animal can either survive for longer on its energy stores or needs to eat less to survive, so it is a very useful strategy when resources are limited or the cost of obtaining resources is high. It has been well documented that echidnas in many areas of Australia (e.g. Melbourne, Queensland, Southern Alps) utilise daily torpor as an energy conservation strategy. There is a strong nychthemeral body temperature cycle (i.e. 24-hour cycle often showing contrasting day and night cycles) evident for short-beaked echidnas, where body temperature is reduced during inactivity to reduce thermoregulatory costs and thus energy requirements. Dr Chris Clemente and Dr Christine Cooper used accelerometers to more closely examine the activity patterns of echidnas and their impact on the ecosystem, which you can read about here. This change in body temperature in response to the environment temperature varied considerably among seasons. The minimum body temperature I recorded for short-beaked echidnas during daily torpor was 11.1°C, which occurred during winter when the ambient temperature was low. The body temperature of short-beaked echidnas in Western Australia was lower than that recorded for echidnas in the Southern Alps and Queensland, both during active and rest phases. This is likely due to the higher ambient temperatures experienced by echidnas in Western Australia, which means they need to have a larger ‘buffer’ zone between normal body temperature and overheating. Echidnas in Western Australia do not display this same deep extended period of torpor their conspecifics in Tasmania, Queensland and New South Wales, and they are somewhat opportunistic and utilise multi-day torpor periods at the coldest times of the year, in contrast to echidnas in the Eastern states that are seasonal hibernators that appear to rely strongly on seasonal cues to trigger entry into hibernation. So, what about when it is hot, how do echidnas cope? 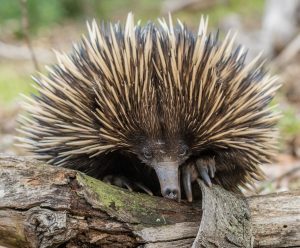 It was long thought that echidnas could not defend their body temperature at ambient temperatures above 35°C, and temperatures above 40°C were lethal. More recently, Brice et al. (2002) found that temperatures in hollow logs that echidnas use for shelter in summer regularly reached 40°C. The maximum environmental temperature (recorded by an iButton attached to the echidnas back) in my study was 59°C, which is well above the previously reported lethal ambient temperature. 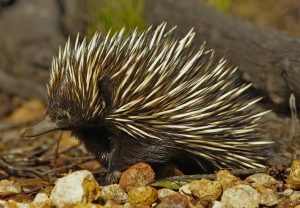 This value includes radiative heat, and is a good indicator of the environmental temperature experienced by the echidna. These data clearly demonstrate that echidnas can survive extended periods of time at very high ambient temperatures while maintaining their own body temperature within a tolerable range. The ability to tolerate such conditions indicates that echidnas are able to control their body temperature, and don’t solely rely on behavioural adaptations to escape the heat. So, in summary. short-beaked echidnas are effective thermoregulators that are well adapted to a low energy lifestyle. Their plastic physiology, combined with their excellent defence strategies mean that they still abundant in an ever changing habitat and are the most widespread native mammal in Australia. Augee M.L. (1976). Heat tolerance of monotremes. Journal of Thermal Biology 1:181- 184.de Miklouho Maclay N. (1883) Temperature of the body of Echidna hystrix Cuv. Proceedings of the Linnean Society of New South Wales 8:425-426. Barker J.M., C.E. Cooper, P.E. Withers and S.C. Nicol (2016). Reexamining echidna physiology: the big picture for Tachyglossus aculeatus acanthion. Physiological and Biochemical Zoology 89:169-181. Nicol S.C. and N.A. Andersen (1996). Hibernation in the echidna: not an adaptation to cold? In: Adaptations to the Cold: Tenth International Hibernation Symposium’ Eds. F. Geiser, A.J. Hulbert and S.C. Nicol. University of New England Press, Armidale. pp. 7-12.